INGREDIENTS: Oat Groats, Corn, Peanuts, Rendered Beef Tallow, Flax Seed, Dried Mango, Crab Meal, Cinnamon (Flavor), Diatomaceous Earth (Flow Agent less than 2%), Pepper (Red) (Flavor), Sunflower Oil, Hydrated Sodium Calcium Aluminosilicate (Anti-Caking Agent less than 2%), Turmeric (Flavor), L-Lysine Monohydrochloride, Calcium Carbonate, Vitamin E Supplement, Niacin Supplement, Calcium Pantothenate, Vitamin A Supplement, Vitamin B12 Supplement, Riboflavin Supplement, Biotin, Vitamin D3 Supplement, Roughage Products, Mineral Oil, DL-Methionine Hydroxy Analogue Calcium, Furmeric Acid, Benzoic Acid (Preservative), Silicon Dioxide, Propionic Acid (Preservative), Acetic Acid, Ammonium Hydroxide, Sodium Hydroxide, Propylparaben (Preservative), Methylparaben (Preservative), Sorbic Acid (Preservative), Fenugreek (Flavor). 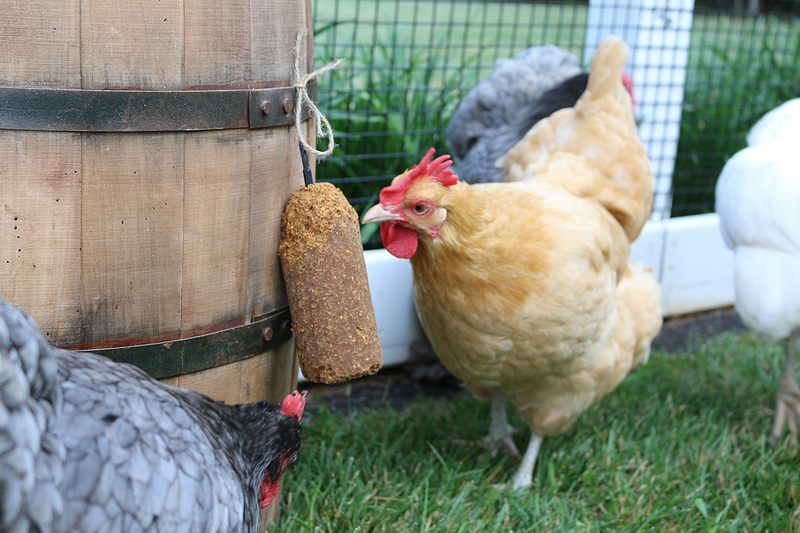 A treat that your chicken will love while supporting normal avian health! 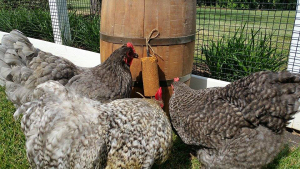 • Quality ingredients like oats, peanuts, mangos, and flax seed. • High-quality animal protein in the form of crab meal. • Flavored with spices including red pepper, cinnamon, turmeric, and fenugreek. 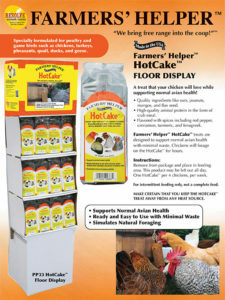 Farmers’ Helper™ HotCake™ treats are designed to support normal avian health with minimal waste. 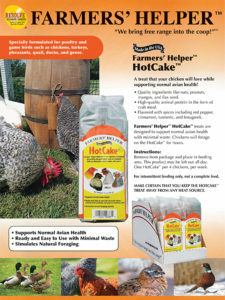 Chickens will forage on the HotCake™ for hours. Remove from package and hang in feeding area. This product may be left out all day. 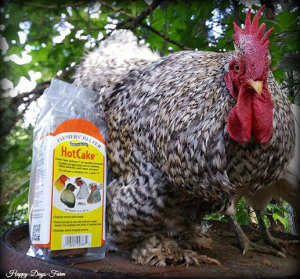 One HotCake™ per 4 chickens, per week. Make certain that you keep the HotCake™ away from any heat source.